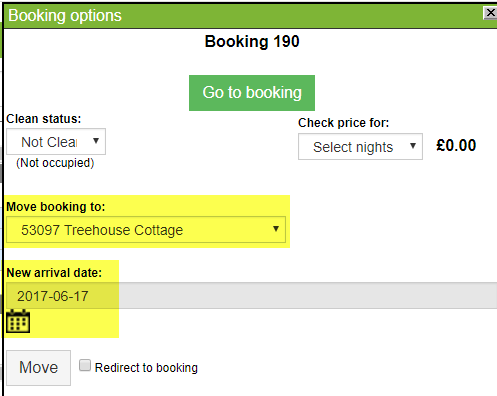 Help CentreUsing SuperControl Managing bookingsHow do I move a booking to a different date or property? 1. To move a booking to a different property or to change the dates of the booking, go to Bookings > Grid view. 2. Click on the booking you wish to move. Then, select the property or dates you want to move the booking to and click Move. 3. The page will refresh and your booking will now display in its new location. You can also move the date and property on a booking by navigating into the main booking screen and clicking “Edit”. This screen allows you to edit the dates, property, prices etc. Prev: How do I add a custom option/extra to a booking? Next: How do you allocate a booking source onto a booking?